AMANDA HERRINGTON: What an exciting finish here. AMANDA HERRINGTON: What is going on in your head? DAVID LINGMERTH: Probably has not sunk in yet, so right now I’m just all confused. Yeah, wondering what’s going to happen in here. AMANDA HERRINGTON: We talked to you last week. Each day in it. This last round could have shaken up any certain way. What a playoff! Talk about your game in that situation. DAVID LINGMERTH: In the playoff? Well, I was pretty calm and collected for the most part. I was really lucky to— or not lucky, but I was happy to make par on that first hole after getting in trouble in the fairway bunker and everything. And then the second hole, I thought I would maybe get a good opportunity to win on that hole because I was in the fairway and he was in the bunker, but that was my worst swing of the playoffs and I had to scramble for another par there. But, yeah, playoffs are exciting and my heart was beating, but I think I handled it pretty well. AMANDA HERRINGTON: Right after that finish you were able to shake the hand of Mr. Jack Nicklaus, what was that like? DAVID LINGMERTH: Amazing. He’s such a good host, a great ambassador for golf. Got to shake his hand a couple of times this week, and it’s nice. It’s an honor being here and winning is surreal. Q. How much were you thinking about winning when you showed up here at the start of the week? DAVID LINGMERTH: The start of the week? I guess I didn’t really think about it that much. I mean, just tried to put a few nice rounds of golf together, and that was pretty much it. Q. When you made the turn at 10, you were three back of the lead. You came birdie, birdie at 11 and 12. Were you trying to play a little more aggressively? Were you paying attention to the leader board then? DAVID LINGMERTH: Not really. Tried to play that way on the front nine, too, just wasn’t able to get as close to the pin as I would have liked maybe. I got two good opportunities there at 11, 12, and 15, as well. My putter has been good all week. Maybe not great yesterday, but Round 1, 2 and 4 my putter was working pretty well. I felt confident when I had those opportunities. Q. When you come off 18 in regulation, you obviously go to sign your card. Can you describe those moments? Were you watching on TV or where were you watching as Justin made that great up-and-down? What were you thinking, during it and before it? DAVID LINGMERTH: After I got done, I was just a little disappointed that I couldn’t make birdie in regulation myself to get to 16. But then I saw Justin— saw him in the fairway bunker and I saw that he— I didn’t see the shot but I saw where his second shot ended up and I thought, you know what, that could be a hard up-and-down. But he hit a beautiful chip shot in there. I knew he could. He’s such a great player. So I was ready to go into playoff right away. Q. Justin makes a 19 footer, I think, drains it in there. Do you just have to compose yourself or were you pretty focused at that point? Or did you have a gulp or what were you thinking there? DAVID LINGMERTH: Yeah, I was thinking to myself that I’d probably have a putt to win the tournament right there. So I was just focusing on trying to get it to go in. And then he drops it in so nicely in and this big, huge roar just kind of— kind of crazy feeling. So I took a few moments just to let the crowd and myself to calm down, because I knew how big that next putt was going to be. I’ve been in a few playoffs. You win some, you lose some. But I didn’t feel that it was my turn to lose this time, I thought I would— yeah, I was telling myself that I was going to make that putt and I was happy to see it go in. Q. What other playoffs were you in? 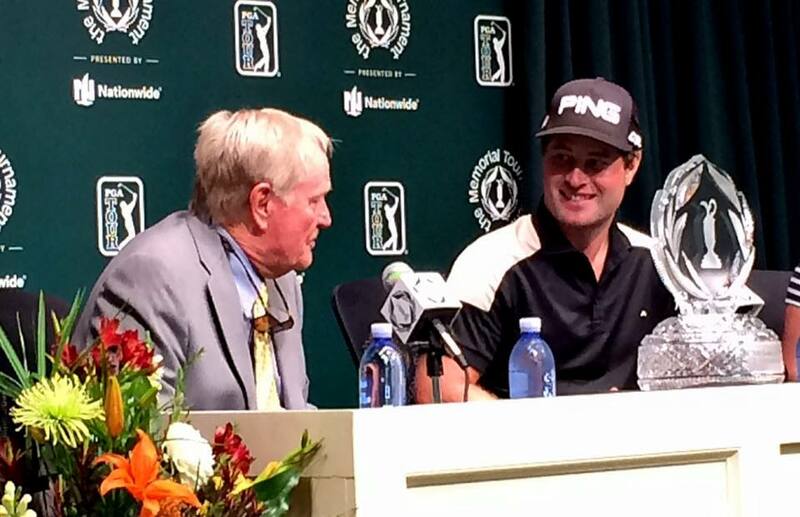 DAVID LINGMERTH: Well, on the PGA Tour, I’ve only been in Humana, Bob Hope. And then also on the Nationwide, I was in, I think, just one playoff there. A couple more times as an amateur. Q. You’ve waited a very long time for this victory. It ends up coming, ironically, on the same day as the big European Tour event in your homeland. How did you wind up here and not there? And was it reluctantly that you passed up your native event? DAVID LINGMERTH: Yeah, I’ve actually chose this tournament over the Swedish event the last three years. I’ve always felt bad about not coming here, because it’s such a great event and everybody loves it. And I’ve loved it, too. It is a little heartbreaking not to get to play in Sweden, as well. But, yeah, sometimes you have to make those decisions. And this year I’m definitely happy I made this one. Q. You didn’t appear nervous out there during the playoff. Justin said he thought you looked pretty calm and collected, like you’d been there before. Do you get nervous when you play golf? DAVID LINGMERTH: Of course, yeah, I think everybody does a little bit. But it’s just about controlling your thoughts and try to keep calm, and sometimes that’s harder than other times. But today I did a pretty good job of that. Q. What’s the better perk, a trip to the Masters or a three-year exemption? DAVID LINGMERTH: I think it’s more like a two-year exemption, right? Oh, it’s three for this one? I like that [laughter]. I like that. So, yeah, that’s definitely nice. But, I mean, the Masters, it’s a dream for so many golfers. I’ve been dreaming about that tournament for so long, it’s going to be awesome. I’m super happy about that. Q. One follow-along, sorry, on the Swedish tournament. How much back at home have they tried to get you to play in that? Bottom line, why have you chosen this tournament the last three years? DAVID LINGMERTH: They didn’t try as hard the last couple years for some reason. But after I got second at The PLAYERS, they wanted me to come home and play. They tried then. Actually, I had never played here, so I wanted to come and experience it. And also the Swedish tournament, they put it in a week where it’s hard if you play on the PGA Tour and you want to play in the majors and stuff. Like I couldn’t qualify for the U.S. Open I tried so many ways to maybe qualify in Europe or whatever and try to make it all work out, but it just doesn’t work. If you want to try to qualify for the U.S. Open, if you’re not top 50 in the world, you have to pick one or the other. Q. When the playoff is going on and on, did you think I might miss my U.S. Open qualifying tee off time tomorrow? DAVID LINGMERTH: No. We kind of joked about it a little bit—me and my caddie—all day, about the qualifying tomorrow, you know. And he was saying, why do we have to play extra holes, we’re going to play 36 home (laughter). But just joking about it. We’ll see how tomorrow goes. As of now, I guess I’m still going to try to qualify. Q. Can you put into words what it means to win and what it means to win this tournament? DAVID LINGMERTH: This is my third year on the PGA Tour, and it’s one thing to be a PGA Tour player, and it’s a whole other thing, I think, to be a winner out here. And just to be on that list of PGA Tour winners is a special feeling and something that no one can take away from me. So I’m pretty happy about that. And this tournament, with Mr. Nicklaus as host, is— yeah, I can’t think of many other tournaments that would be put above this one. So I’m pretty thrilled. AMANDA HERRINGTON: At this time we’d love to hear from our tournament host, Mr. Jack Nicklaus. At the beginning of the tournament week, you recapped the 39-year history of this event. Talk a little bit about the history that was made today. JACK NICKLAUS: Well, as I said out in the presentation, there’ve been several players, and particularly one I can think of that came to mind was Kenny Perry who started his winning career here. When Kenny Perry came here, Kenny had played some good golf, but he hadn’t won. When he won, now all of a sudden we heard of Kenny Perry. They said “who is Kenny Perry?” Well, Kenny Perry just happened to win a couple more Memorial Tournaments and won a PGA Championship and several senior majors. And I think David is just getting started in his career. That’s great. We’re looking forward to that. We’re going to give him an opportunity to have a little bit of relaxation, not having to worry about week to week. And he’ll be able to go out there and play and concentrate on his game. Boy, did he play well coming down the stretch? Even when he hit the ball in trouble, he got out of it pretty good. That pitch you played on 18 in the first playoff was something else. I didn’t see how you could keep the ball— well, you didn’t keep it, actually, too much longer, but I didn’t know how you could even get it inside the bunker and get it on the green and get in there. You almost holed it, you lipped it out of the cup. But every hole he just keeps making those little 4 and 5 footers that he had to make and he did. So from that part, it was great. As it relates to the tournament, we had four perfect days of weather. The golf course was in perfect condition. The scoring— the golf course is there to be taken. 15 under par is probably about average of what we’ve been here through the years, I think, as far as a winning score. It’s a good score. It’s an indication that the players found the golf course not extremely difficult, but they also found it challenging enough that they didn’t tear it apart. What’s our tournament record? 268? That was Tom Lehman, scored four 67s. So it was similar weather then, when we did that. I thought everything went well from the week. Nick Faldo was a great honoree. He was very humorous in a lot of places, and everybody enjoyed him. We’re looking forward to having Johnny Miller next year. We’re also going to have Horton Smith and Leo Diegel. So we’ve set a pattern. The Captains Club started on a pattern about two or three years ago of picking— set honorees that we were going to take care of, that we would never probably get to when they were alive. So that’s what we’re doing. And I called Johnny. Johnny was very thrilled. He says, you’ve got to be kidding. I said, no, I’m not kidding, Johnny. I said if you hadn’t caught that last fish when we were together, we probably wouldn’t have done it. But that fish caught it. In case you don’t understand that, I take Johnny fishing occasionally. So it was a great week. We were very pleased. Justin played great. And once you get down to a playoff, somebody’s got to win and somebody’s got to lose. And David stayed right there and won. Well done. Q. I was curious, how much being in contention at The PLAYERS a couple of years ago and then the playoff, you mentioned today with the noise, with the moments? DAVID LINGMERTH: Yeah, it’s definitely something that I could look back on, because I knew I handled myself pretty good back then at The PLAYERS there. I didn’t end up winning, but I did all right. But I feel like yesterday playing in the final group I was probably more on edge. I think I learned a lot going through a tough stretch there from like 10 through 14. I was struggling a little bit. And then I had to refocus for those last few holes to kind of put myself back in it a little bit again. And I learned a lot fighting back there those last few holes. Q. To play without showing emotion, which I would think helps in a playoff, is that something you had to work on or does that come naturally to you? DAVID LINGMERTH: I guess it comes naturally. I haven’t really worked on it. I’m just trying to stay [on an] even keel. Q. You were at minus 12 halfway through, 3 under the rest of the way. What was it about the weekend that presented so many challenges for you and maybe for the golfers as a whole? DAVID LINGMERTH: Well, I think the weather was beautiful all week. But the last two days, I feel were a little bit more challenging. This course was not quite as slow over the week, I think. JACK NICKLAUS: A little wind. DAVID LINGMERTH: A little wind, right, especially today. Also the pin positions were very hard. You can’t short-side yourself out there. It’s gnarly rough and fast greens. With those pin positions, it was pretty difficult the last two days. Q. Going back to a comment you made earlier, you said you didn’t feel like it was [your] turn to lose, I guess, had you ever felt that way before? DAVID LINGMERTH: Because I did lose my last two, I guess, at the Bob Hope a couple of years ago and on the Web.com Tour I lost a playoff, too. So I guess coming into this one, I had lost my last two, and I thought, I’m not going to lose this one. It’s my turn now. Q. You were determined, in other words? Q. Was it hard to watch some of the shots Justin was making and think otherwise? DAVID LINGMERTH: Yeah, when he made that putt, I was like, really, again? It’s like, okay, now I’ve really got to step on the pedal here and try to make something happen myself. Yeah, I had to settle myself down a little bit there. JACK NICKLAUS: You don’t think that was a tough putt, that one he holed, the first playoff hole? DAVID LINGMERTH: Yeah, it was a little slider. JACK NICKLAUS: One tough putt. AMANDA HERRINGTON: You’ve answered a lot of questions. Mr. Nicklaus, if you want to give us some last closing comments. JACK NICKLAUS: Thanks for being here. Thanks for a great week. You’ve all treated us very well. We appreciate that. And we look forward to having David defend next year. In the meantime, we’ll see all of you along the way. How’s that? DAVID LINGMERTH: Let’s go have a milkshake. JACK NICKLAUS: He said he’s avoided the milkshakes all week. Now he can have one.